Eric González Alfaro joined the WSLC as Legislative and Policy Director in January 2016. 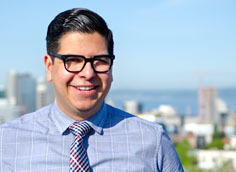 Eric recently served as staff lobbyist for Washington’s largest immigrant and refugee rights organization, OneAmerica. There he worked to help close the education opportunity gap, protect voting rights, and defend vulnerable working families from the deregulation of predatory payday lending in our state. Prior to OneAmerica, Eric served as the director of the Equal Justice Coalition, a non-partisan grassroots organization working to increase federal, state, and local funding for Washington state civil legal aid programs. Because of his work, investments in legal aid increased, further enabling families in crisis avoid foreclosure, thwart fraudulent or predatory practices, protect people from domestic violence and maintain employment, healthcare and a livelihood. Eric is a first generation Mexican-American and first generation college graduate. Eric’s parents are former migrant farmworkers who continue to rely on apple industry jobs for their livelihood. He was raised on an orchard a few miles outside East Wenatchee, where throughout his youth surrounded himself among farm laborers and their stories of struggle — many of which mirrored those his father endured in the 1970s traveling job to job in Central Valley, California to the Yakima and Wenatchee Valleys. Both his parents adjusted their status in the mid-1980s but lived in the shadows as undocumented workers until then. Eric earned his first paycheck working the fields, planting trees, installing irrigation-lines, thinning and picking apples, and pruning trees down for the winter; this work he often did before and after school to help his parents make ends meet. His upbringing is why he’s dedicated his professional career to promoting social and economic justice, and to pursuing a life-long goal: giving a voice to those in need. In his spare time, Eric volunteers his time on the Board of the Washington Bus (a youth-focused non-profit organization working to increase youth civic access), lends his skills at KEXP as an in-studio photographer, and enjoys spending time in his small kitchen attempting to perfect his mother’s recipes. Eric can be reached via email.